My roof has black streaks and brown streaks! Black streaks running down your roof doesn't mean asphalt shingles are dissolving or that you need a new roof. Your roof simply needs to be cleaned, removing what is known as Roof Algae! These brown and black streaks are a species of cyanobacteria bacteria called Gloeocapsa Magma. Gloeocapsa Magma (glo-e-oh kap-sa mayg-ma) is also referred to as Roof Algae. These black streaks that discolor your asphalt roof come from airborne spores and can be spread from roof to roof by wildlife such as birds and squirrels. 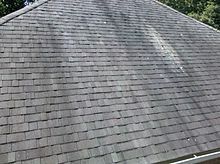 Roof Algae feeds on the calcium carbonate or limestone, contained in most asphalt shingles so once these streaks appear on your roof, they will not wash away on their own, they will only get worse. Looking down on houses within a neighborhood, one can see that the gloeocapsa magma gradually infests an entire neighborhood. Roof Cleaning is the cure! These ugly streaks can be safely removed and we follow roofing manufacturers guidelines. That's right, we can safely remove those ugly streaks along with lichen and moss build up from your roof without any high pressure from a pressure washer, extending the life and luster of the curb appeal! Often mistaken as mold or mildew, the black discoloration and streaks visible on many roofs across the United States and Canada are actually algae. The algae can form where moisture tends to dwell on roof surfaces. Coastal or humid climates create the most conducive conditions for algae growth. The most common type, gloeocapsa magma or blue green algae, protects itself from damaging ultraviolet rays by producing a dark pigmented sheath. The algae discoloration typically begins as small spots then quickly transforms into streaks on the roof plane. By the time the algae is visible, it likely has been present for several months or longer. Algae spores are carried by the wind or by animals and can quickly spread from one rooftop to another. That is why it is common to see algae growth on rooftops throughout an affected neighborhood. The same is true for apartment or condominium complexes, townhouses or row houses. There is no scientific evidence that algae is damaging to asphalt shingles, although it certainly affects the aesthetics of a roof. On highly reflective or “cool” roofs, algae will undoubtedly have a negative impact on the long-term effectiveness of these roof systems. That is why it is important to address an algae problem as soon as possible. Moss is a non-vascular plant that obtains water through its leaves, unlike most plants that gather water through its root system. Moss must therefore have a moist environment to survive. In North America, moss tends to grow on north facing roof planes that receive less direct sunlight and stay damp longer than south facing planes. Overhanging tree branches provide additional shade and drop debris on the roof that further holds in moisture and acts as a food source for moss. Moss spores may also be carried by wind or animals and can easily spread throughout neighborhoods. Unlike algae, moss can be detrimental to asphalt shingle performance. Moss can cause the leading edges of the shingles to lift or curl, which increases the risk of shingle blow-off during wind events. In severe cases, moss build-up can cause lateral water movement resulting in moisture damage to the roof deck or may even cause leaks. The most effective method of cleaning algae and moss from a roof is with a 50:50 mix of laundry strength liquid chlorine bleach and water. Apply with a sprayer and allow the solution to dwell on the roof surface for 15 to 20 minutes, and then rinse thoroughly with low pressure water. Extended dwell times may be necessary, however, avoid letting the solution dry completely as this may prevent complete rinsing. Take proper precautions to protect landscaping and surrounding areas from the chlorine bleach solution. Use appropriate personal protective equipment when working with chlorine bleach. Algae will disappear and w ash away with subsequent rains. Moss will loosen over time and may be removed with a leaf blower. In severe cases, it may take more than one bleach treatment to kill all of the moss. Never use a pressure washer to clean an asphalt shingle roof as this w ill cause granule loss and very likely premature failure of the roof system. · Debris that does begin to accumulate on the roof should be cleared regularly with a leaf blower or similar, non-abrasive method as part of a regular maintenance program. · Air flow should be directed down the slope to avoid driving debris under the edges of the shingles. · Keep gutters clean to promote proper water drainage. Do not allow gutters from an upper roof to drain directly on a lower roof; extend the downspout from the upper roof into the lower gutter. Other preventative measures —such as adding zinc or copper strips to prevent both algae and moss, or applying asphalt shingles that incorporate algae resistant copper granules —may be employed when it is time to replace a roof. Currently, there are asphalt shingles available that use algae resistance technology. Adding zinc or copper strips to an existing roof is not recommended since this will require either applying the strips with exposed nails (which can cause leaks over time) or breaking the sealant bond (which may eventually result in wind damage) to slide the strips under the shingles. Algae and moss growth on roofs, at a minimum, is an unsightly nuisance. Moss build-up can lead to roof damage or shingle blow -off if left unchecked. Keeping branches trimmed back from the roof and removing any debris that begins to accumulate should be part of a regular roof maintenance program. If moss or algae becomes visible, clean the roof with bleach and water mixture as described above to prevent the spread to nearby roofs. We will clean your roof using a soft wash process that will not harm your shingles and leave your roof looking new again! We are currently serving Lebanon, Morrow, Maineville, Monroe, Springboro, Waynesville, Middletown, Franklin and West Chester.